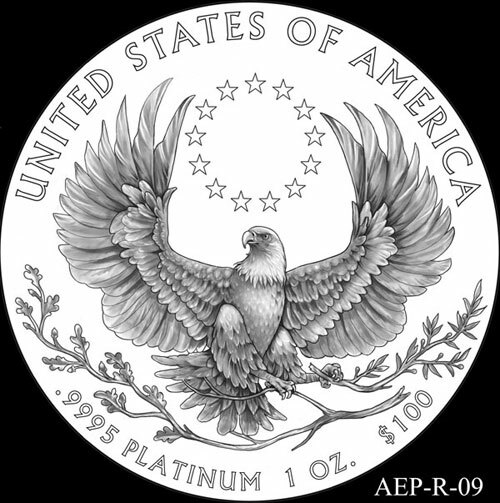 The United States Mint recently provided the Commission of Fine Arts (CFA) and the Citizens Coinage Advisory Committee (CCAC) with a set of 30 design candidates for the reverse of the 2015-2016 American Platinum Eagles. The two groups each offered different recommendations on their preferred set of designs. 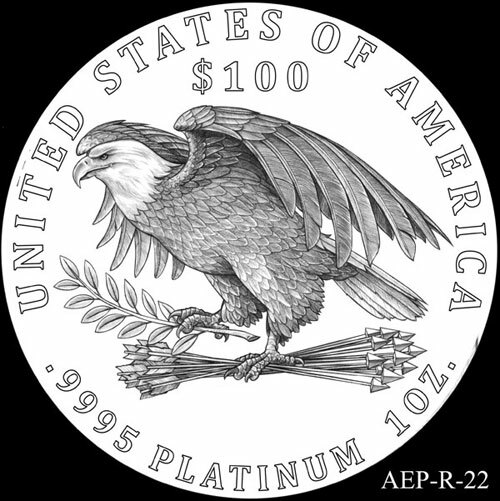 The American Platinum Eagle was introduced in 1997, representing the first ever platinum coins produced in the United States. The .9995 fine coins have been offered in bullion and numismatic format. From the second year of the series onwards, the numismatic versions have featured annually rotating reverse designs covering different themes and subjects. In some instances, a multi-year design theme has been followed, such as the initial “Vistas of Liberty” series and the most recent six-year “Preamble” series highlighting the core concepts of American democracy from the Preamble to the Constitution. For all years of the series, the obverse design for both the bullion and numismatic issues has featured a portrait of the Statue of Liberty designed by John Mercanti. When the Commission of Fine Arts reviewed the design candidates on September 18, they noted the appearance of an allegorical figure of Lady Liberty on the obverse and supported depictions of eagles for the upcoming reverse designs. For 2015, they recommended alternative #9 which depicts a bald eagle grasping an olive branch in its talons to symbolize peace. The eagle’s wings are outstretched to represent its boundless spirit of freedom and a circle of 13 stars above the eagle’s head represent the original 13 colonies. As a potential continuation of the series in the following year, they recommended alternative #22. The design features a depiction of an American bald eagle as a symbol of strength and freedom. The eagle is depicted in the heraldic tradition with its talons grasping an olive branch to symbolize peace and bundle of 13 arrows to symbolize the strength and ability to protect. The CFA suggested refining the awkward position of the eagle’s legs and to consider replacing the bundle of arrows with wheat stalks. The Citizens Coinage Advisory Committee reviewed the design candidates on September 24 and opted for a different set of designs. They recommended alternative #6 which carries a depiction of Liberty and an American bald eagle representing Freedom. In the image, Liberty is shown nurturing and sustaining Freedom. The CCAC suggested removing the dish in Liberty’s hand and rather showing the hand as open and extended. 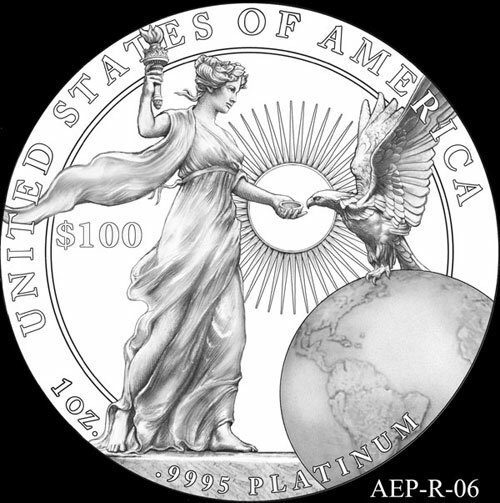 They further suggested showing eye contact between Liberty and the eagle, removing the inner line concentric with the “United States of America” text to create a cleaner design, and repositioning the Earth to show the United States. Their second recommendation was for alternative #7, which depicts Liberty with flowing hair and robe waving in the winds of freedom. Liberty holds a torch of enlightenment in her right and and an olive branch in her left. A bald eagle is shown clutching an olive branch with its wings outstretched to represent its boundless spirit. The CCAC suggested removing the olive branch in the eagle’s talons to create a cleaner design. In making their recommendations, the CCAC had discussed the idea of a “Liberty and Freedom” series to present a thematic connection between the 2015 and 2016 issues. The idea stems from the iconology of the selected designs. 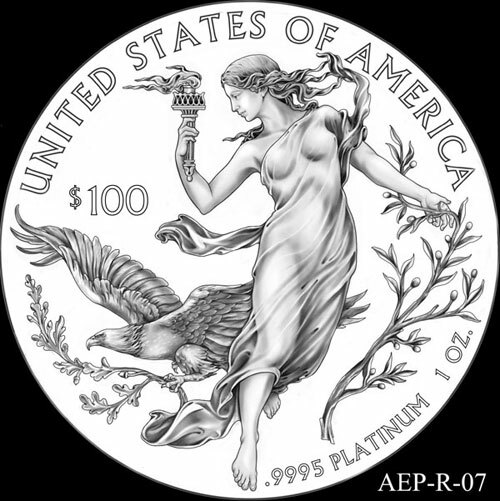 In the iconology of American medallic design, Liberty is portrayed as a female form and freedom is represented as an American bald eagle. The idea of a potential two-year theme was a suggestion of the CCAC with the ultimate decision left to the United States Mint. In R-07, the branch in the eagle’s talons is actually oak — oak leaves have multiple usually-rounded points, while olive leaves have a single sharp point, as shown in Miss Liberty’s grasp. The artist probably wanted to associate the idea of Liberty with Peace (olive branch), and the Eagle with Strength and Power (oak branch). Perhaps the artist wanted to show that peace and liberty are related to strength and power — you can’t have one without the other.